Bamboo for green development in South Africa? Bamboo is a renewable resource that has many economic and environmental benefits. Because of its potential contribution to sustainable development, private companies and governments have begun to promote its commercialisation across Africa. A recent study led by HSRC researchers examined the opportunities and challenges of commercialising bamboo in South Africa. Bamboo is the strongest, fastest growing perennial grass species that can reach up to 30m in height and 1m growth a day. Some species can be harvested 3-4 years after planting and new technologies offer unprecedented opportunities for commercial production and local industrialisation. More than 2 000 products can be made from bamboo with low- and high-skilled manufacturing. Bamboo products are used in industries as diverse as bioenergy, construction, textiles, furniture, flooring, aircrafts, medicine and mining. The global market value of bamboo is currently estimated at USD 3.6 billion. As an alternative fibre, it offers important environmental benefits including climate change mitigation, adaptation and soil restoration. The most important bamboo industry is in China, with a 7 000 years history of cultivation and use. China has approximately 6 million hectares of bamboo forests, an increase of 54% since the 1970s. Between 1977 and 2003 its manufacturing capacity increased from fewer than 2 000 to 12 190 processing plants. In some of the ‘China Bamboo Hometowns’, the bamboo industry contributes more than 20% of their gross domestic product and accounts for about 40% of total household income. China accounted for 65% of world exports with an estimated value of USD 1.207 billion in 2013. The world’s largest import market is Europe, which represented 38% of total imports. In recent years, several African countries have partnered with the International Network for Bamboo and Rattan (INBAR) to establish large-scale bamboo plantations and processing plants, with the goal to turn degraded land into environmentally sustainable and economically viable landscapes. 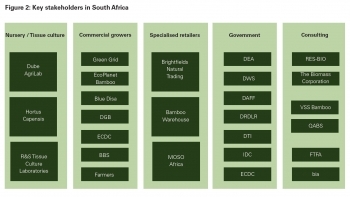 South Africa is not part of the INBAR network, but interest in the bamboo industry started in 2011 when the Industrial Development Corporation (IDC) and the Eastern Cape Development (ECDC) co-hosted a Bamboo symposium in the Eastern Cape to promote commercial cultivation in the country. The symposium led to the establishment of a few pilot projects and other forms of international and local investments. Despite these developments, little is known about the actual opportunities, challenges and impacts of commercial bamboo in South Africa. This research project aimed to shed light on these issues. From September 2016 to May 2017, researchers collected data through literature reviews, document analysis, 34 semi-structured interviews, a one-week site visit to KwaZulu-Natal including the Green Grid Beema Bamboo project, and a stakeholder engagement workshop in Durban. The researchers identified seven key commercial initiatives in the country with approximately 750 ha of land under cultivation (Figure1). The projects range from individual farmers experimenting with bamboo cultivation and harvesting to small corporate social investment programmes to offset carbon emissions to large-scale plantations for alternative fibre and bioenergy production. EcoPlanet Bamboo and Green Grid Beema are the two largest projects, each cultivating more than 300 hectares of bamboo. EcoPlanet Bamboo in the Eastern Cape belongs to a leading multinational company specialising in substituting wood fibre products with bamboo. Green Grid Beema Bamboo in KwaZulu-Natal received funding from South Africa’s Green Fund and is a national demonstration project for generating bioenergy from bamboo. Smaller bamboo projects also operate in the Eastern Cape or KwaZulu-Natal, because these provinces are considered to be the most conducive regions for commercial growing due to soil, climate and rainfall conditions. 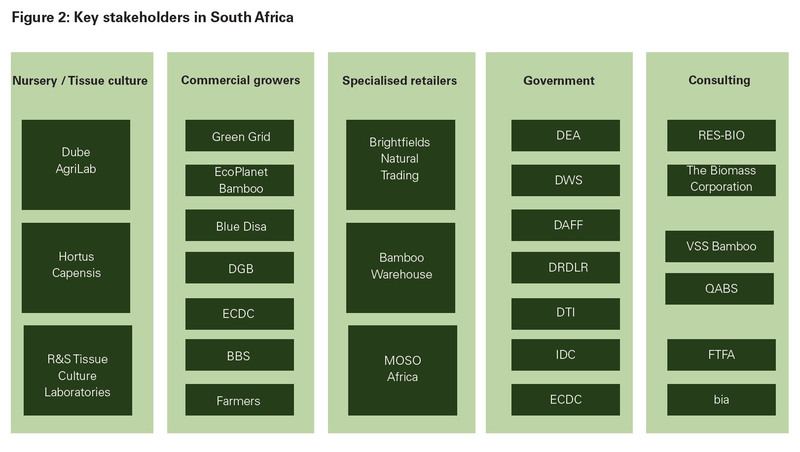 In addition to commercial growers, there are nurseries/tissue culture companies, specialised retailers, government agencies and consulting companies across the country, which have engaged in the local bamboo industry (Figure2). Nurseries and tissue culture companies have been very influential in promoting the commercialisation of bamboo. They propagate and harden young bamboo species for South Africa’s commercial growers. They import selected species and prepare them for planting. The two largest projects (EcoPlanet and Green Grid) established their own nurseries at the project sites. Bamboo products can be found in the major retail stores and there are three specialist retailers in the Western Cape, KwaZulu-Natal and Gauteng. Several government departments have provided support to bamboo growers and have shown interest in promoting local commercial cultivation and manufacturing. Private consultants, who have developed a wide range of expertise on local bamboo cultivation, have provided support and information to all stakeholders identified. 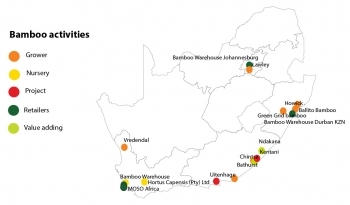 The research project was the first attempt to assess the local bamboo industry and identify the most important opportunities and challenges of commercial bamboo growing in South Africa. The findings revealed promising opportunities for bamboo products, but project owners must find ways to overcome considerable challenges. Access to land is a big challenge because much of the land that has high potential for bamboo growing is under traditional authorities and communal governance. Project developers face difficulties with internal community dynamics and complex land tenure arrangements. These difficulties resulted in delays of many of the projects, some stopped altogether. Because bamboo is relatively new in South Africa, there is much uncertainty over market demand in local bamboo products and there are no appropriate insurance instruments for growers against unanticipated losses. Financial institutions are reluctant to invest because of the perceived risks and uncertainty. Bamboo growers face technical challenges, including problems with the establishment of infrastructure, nurseries, planting, growing and maintenance, harvesting and processing. Often, these challenges resulted in unforeseen expenses. There are also many policy and regulatory uncertainties. For example, it was not clear whether national government regards bamboo as a grass or a tree, which, among other factors, hampered the development of an enabling regulatory framework. Although bamboo is promoted as an environmentally sustainable resource, its commercialisation can negatively impact on the environment through land conversion, biodiversity loss, invasiveness and water consumption. The invasiveness of some bamboo species can threaten biodiversity and ecosystem services. There is also a lack of information on the total water usage of bamboo. We need much more research and policy attention to support the nascent bamboo industry and to create an appropriate regulatory environment that can maximise the socio-economic benefits and minimise environmental risks that come with commercialisation. There are many uncertainties about the social, economic and environmental impacts of large-scale commercial bamboo plantations. Therefore, an important first step would be to establish inclusive platforms to discuss the most important challenges and to identify solutions. Pilot projects need to be incentivised to share lessons learnt and build national capacity. Stakeholder forums should be regularly conducted to build local knowledge and experience. 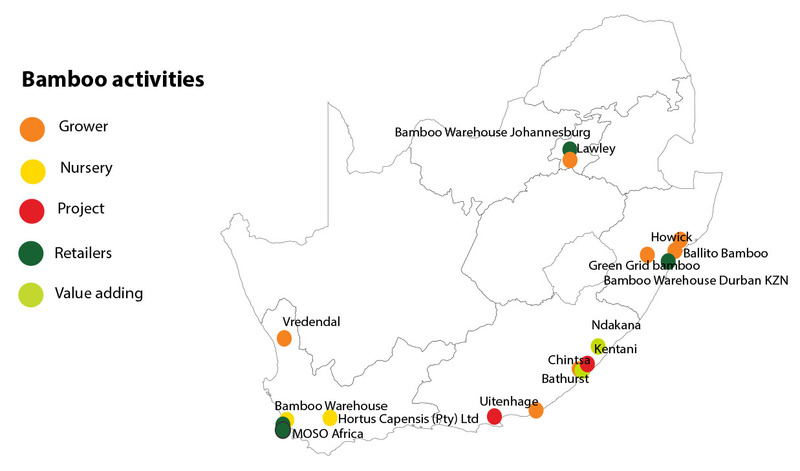 More market research is required to better understand the specific opportunities of bamboo in South Africa. Dr Andreas Scheba, project leader and post-doctoral fellow of the HSRC’s Economic Performance and Development programme, HSRC research assistant Setsoheng Mayeki, and Dr Ryan Blanchard, senior researcher at the Council for Scientific and Industrial Research and the Centre for Invasion Biology at Stellenbosch University. Dr Amber Huff from the Institute of Development Studies and STEPS Centre in the UK supported the project through a Governing the Nexus grant from the Economic and Social Research Council and a British Academy Newton Mobility grant.